The CopperWay-Bis product delivers four Ethernet ports and four V24/RS232/RS485 asynchronous serial interfaces throughout an industrial infrastructure made of copper pairs and / or optical fiber lines. CopperWay-Bis has four transmission accesses: two 2/4 wires SHDSL interfaces each with a throughput of 11.4 Mbps per pair or 22.8 Mbps per access, and two 100FX optical ports with versatile SFP modular interfaces. These interfaces support any multipoint topologies - star, bus or secured ring.The DSL connections are secured with a CXR unique security protection that enhances the single point of failure immunity. 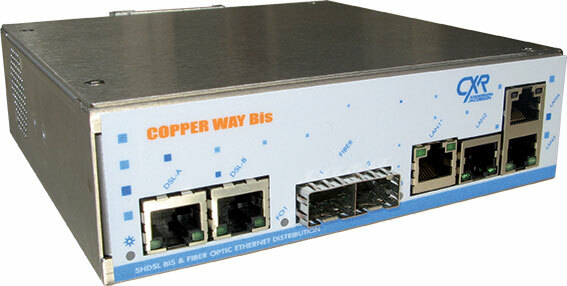 CopperWay-Bis embeds a high performance Ethernet switch that minimizes transfer delay in the equipment, and reduces the end-to-end delay over the network. The first Ethernet port also delivers a 15 W POE source to feed other equipment such as an IP-camera. A rich set of Ethernet features enables traffic and Quality of Service controls. Several application traffics can be isolated into different VLAN's and allocated an appropriate class of service (rate limiting, priority queuing). CopperWay-Bis brings one or four asynchronous serial ports with ip/tcp/udp protocols and an adaptation layer to connect to existing RS232 or RS485 equipment and even emulate older multidrop or Master-Slave modems. Digital inputs and dry contact relays are also provided for binary system controls. CopperWay-Bis comes as compact and robust metallic enclosure with DIN rail mounting and a two 12-48 Vdc power inputs. A 19'' mounting kit is offered on option. Managing the product is very easy through a intuitive Web interface. Network management protocols are ssh, http/https, ftp and snmp with a graphical MIB. CopperWay-Bis serves industrial networks with a mix of multipoint and RSTP resilient ring topologies. It replaces older multidrop or Master-Slave modems and brings valuable advantages to the Transport or Utility networks such as several Mbps speed over existing copper cables. VLAN, rate limiting and QoS functions enable a strong control of various application traffics over the network - control, remote metering, video, etc. Both SHDSL accesses deliver up to 22 Mbps Ethernet speed on existing copper cables which preserves total CAPEX/OPEX and enables new services on existing infrastructure. CopperWay-Bis is a perfect solution to long lasting applications and infrastructures. It connects RS232/RS485 serial equipment (RTU, controller, etc.) to the IP network with an application aware adaptation layer that emulates all kind of asynchronous protocol including multidrop or Master-Slave modems. New generation Ethernet devices connect to the four Ethernet ports.